One of the best selling ATV tires of all time is the Carlisle 489. It is a basic OEM tire that you see on many machines right from the factory. 489 tires are great for all purpose use. If you are looking for a reasonably priced tire that will get the job done in most riding conditions, this is a great buy. It's all-terrain tread design and flexible carcass provides a nice smooth ride and good traction. For a more aggressive tire similar to this view our 489 XL tires. Carlisle ATV tires have proven themselves to be one of the best in this industry. - Carlisle atv tires are sold individually. 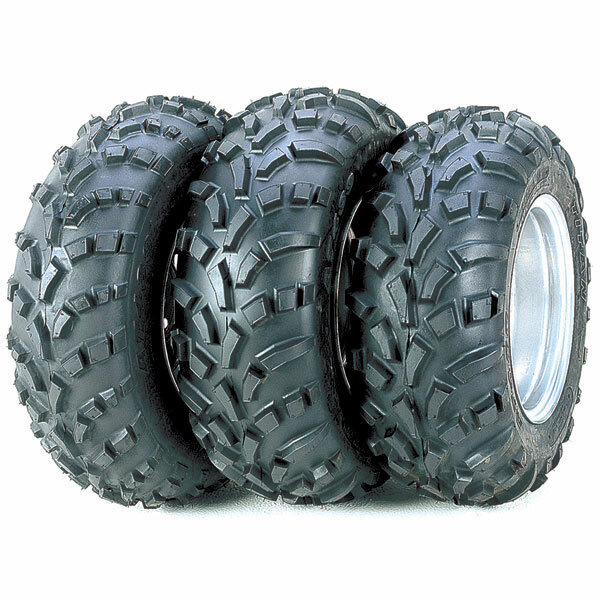 - Our 489 ATV tires generally ship out within 1 business day! - The OEM Tire of choice for Polaris and Arctic Cat. - Great shock absorption capabilities. - Outstanding traction for both 2WD and 4WD applications. Pure Offroad is a pleasure to order from. Have used them a couple of times and they are great to work with. I bought a pair of 24x11x12 for my Zero turn lawn mower.With the turf tires the turning was hard due to loss of traction.With the 489's there is no problem turning.But beware that making sharp turns will tear up the grass.Gradual turns are no problem. I bought these tires for my husband for Christmas. They are exactly what he wanted. He is very pleased with them. Delievery was very fast and just what I had ordered. The tires are also great. Very fast and free shipping! The tire work perfectly. I bought them so I could plow snow and haul firewood out of my woods. My Old Polaris Sportsman 500 is used daily for work around the place. Will buy from Pure Off Road again! Excellent value, delivery time and quality tires. Great Tire for the money ....... Super Service ....... Fast Shipping ....... What more could you ask for! Good product! Fast and friendly service. Recevied product within a few days! Fast shipping! These came on my Polaris when I bought it years 10 years ago. Figured why mess with what worked all these years. Price what the best I could find, dealer here wanted 2 times as much for the same tires. Fast shipping. Very happy so far. These tires came on my Polaris ranger from the factory. They seemed like great tires. So, I order another set to replace them. But, I think Carlisle changed the design. The new 489 ATs are not nearly as good as the old ones. In fact, the tread is coming apart at the seams after only a month of riding. I am a bit disappointed. I will be looking for a different tire next time. Very fast and free shipping! The tire work perfectly. I bought them so I could plow snow with my Suzuki mini truck without using tire chains. No chains needed, these tires are aggressive. Thanks. Very Fast Shipping! Great Company to go with! Lowest prices on these tires plus free shipping, what more could you ask for. Can't wait to try them out next weekend. tires fit and run perfect fast fast delivery and free shipping and great prices 10 plus!!! Q: part number CAR4_4893 size(23-8-12) Do ship in india and tires spcfication and rate? A: I'm sorry we don't ship to India. Q: Can it be on-road use? A: This tire is not DOT approved so technically it's not legal to use on the road if you are trying to make your quad street legal and your county/state requires DOT approved tires. It's designed to be used off-road. Q: Do you have the word "off road only"printed on the tire? Q: Are the 4 hole rims included with tires? A: This is just the tires. Rims are not included. Q: What ply are these tires? Q: I need a tire and this is the size,24x11.00-10 KT 869 Do you carry them please? A: We don't carry the KT869 anymore because it's been discontinued. but we carry one just like it. It's called the Duro DIK968. You can view them on our website. Q: are the rims included? A: No, these are just the tires.